Mission:Comics and Arts has been reaching out to the community in an effort to keep their doors open. This Thursday Pops Bar & BFF.fm lend a hand by hosting a benefit show at 8pm with a suggestion donation at the door of $5-10. Enjoy a night of music by Doc Pop, Silverware, Space Toilet & Schlub. Mission: Comics & Art is a junction point for the worlds of comic books, popular culture and fine art. Known for strong community involvement in the mission, the space is often used for art-related happenings, including lectures, monthly gallery shows and storytelling events. Be sure to Hop on Pops this Thursday to support their effort to stay in business, all the while having a great time in the process. 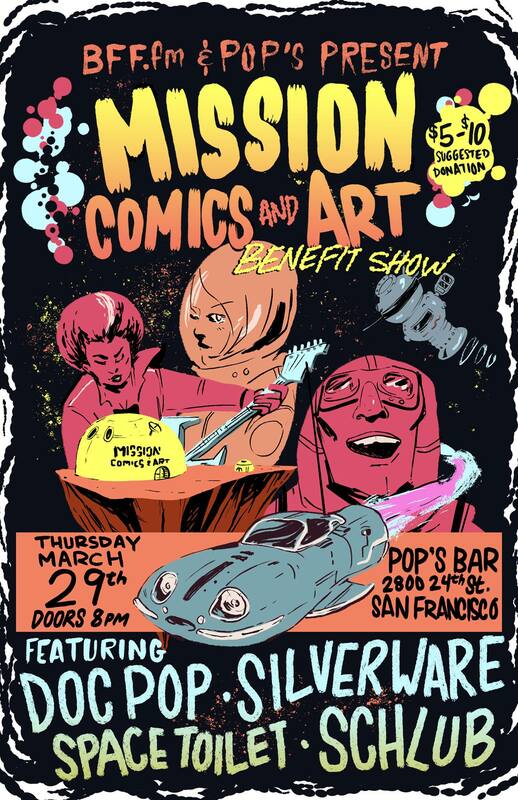 Benefit show to help Mission Comics and Art stay open! Catmandu Takeover of Pop’s Bar. Free entry. All your favorite Catman DJs will be playing their finest tunes. All proceeds benefit Catmandu Camp 2017.